All 67 entries for CA2016 have been uploaded into the Caldera Art website where the images and statements may be viewed. Many thanks to Denise Scott for expertly compiling this webpage. The Caldera Art Gallery will exhibit all the actual works over two separate exhibitions (refer program link). Half will be exhibited from mid October to mid December and the other half from mid December to mid February. The first exhibition will be part of the 2016 Tweed River Festival program (as it is each year). CA2016 will be officially opened by the TSC Mayor Katie Milne on the 21st October. 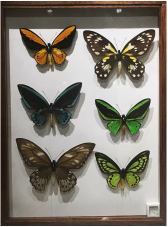 Some of the most beautiful butterflies from Australia, Asia and South America are currently on display at Tweed Regional Museum Murwillumbah. Twelve cabinets of colourful butterflies collected and prepared by Greg Newland will be on display from Tuesday 27 September until February 2017. Greg’s interest in collecting is sustained by the environmental messages his collection represents. ​Butterfly numbers have declined over the decades since Greg first started collecting with threats to their future survival in the Northern Rivers caused by habitat loss due to land clearing, exotic weed invasion and excessive use of pesticides. Butterflies are an important part of the natural ecosystem and perform many roles, including pollination. Greg will speak at the Museum on Saturday 8 October at 11am about his journey collecting butterflies and the stories the exhibit reveals. Now live on the CW website, this half day drive follows the Oxley River (formerly known as the Tweed River Middle Arm) and the Rous River (North Arm) from Murwillumbah and heads west to beyond Tyalgum. Highlights include dramatic views of the western and northern caldera escarpments including the Limpinwood and Numinbah Nature Reserves. There are several commanding roadside views of the upper catchments, especially the source of the Oxley River from Stoddards Road west of Tyalgum (see image below). Also includes a visit to the Tweed Regional Museum (allow an additional hour or two to experience this destination). ​Council is preparing a new management plan for the Tweed River Estuary (the tidal section, 35km in length between the Bray Park Weir at Murwillumbah and the river mouth at Tweed Heads). This scenic waterway and picturesque surrounds are used extensively for recreational activities and are extremely important to the local community. The estuary retains a significant cultural connection for Aboriginal people. It is highly valued as a commercial waterway, integral to tourism and agricultural practices on the floodplain, contributing to the local economy. It has a diversity of habitats for a wide variety of plants and animals and is home to a number of protected flora and fauna species, including estuarine vegetation (mangrove, saltmarsh and seagrass), shorebirds, raptors and fish species. Maintaining the environmental health of the river is essential to sustain all its beneficial uses by the community. There will be a information stall at the Tweed River Festival (main event in Tumbulgum this year to complement their 150 year celebration) on Sat 12th Nov. More details on the Tweed River Festival in the Nov. e-news. A prolific landscape watercolourist, Anki is also very proficient at wildlife art. Her recent work, 'The Young are So Optimistic' depicting a family of Bush Stone Curlews (below left) helps draw attention to the plight of these remarkable birds. Recently a pair of chicks hatched in Kingscliff's Jack Bayliss Park and are being closely monitored. Anki also kindly donated a landscape painting (below right) as a raffle prize for the forthcoming Tweed Fusion Festival. One of the events is 'An Operatic Afternoon' where professional performers are waiving their fees and all profits will go to the You have a Friend charity. The Caldera Wildscapes 2017 calendar features images of 8 iconic landscape locations within Australia's Green Cauldron, and 4 stunning images of birds and rainforest. This is the first full colour calendar (one page per month) that truly showcases the natural wonders of this region. Another first for Caldera Art & Wildscapes. Calendar may be purchased in the CW Store page, or at the Murwillumbah Visitors Centre. Celebrate National Bird Week by taking part in the biggest citizen science project to hit Aussie shores! Thousands of people from across the country are heading out into their backyards, local parks or favourite open spaces to take part in the third annual Aussie Backyard Bird Count! To get involved all you need is 20 minutes and some keen eyesight (or binoculars). It doesn’t matter if you’re a novice or an expert. Simply record the birds you know and look up those you don’t on the ‘Aussie Bird Count’ app or the website. You’ll instantly see live statistics and information on how many people are taking part near you and the number of birds and species counted not just across your neighbourhood but the whole of Australia! ​This month's mystery Wildscape (below): What is the name of the foreground peak and from which public road was the photo taken? Photo taken from Settlement Rd (off Numinbah Rd) looking NW over Numinbah Creek Valley, with the Nerang-Murwillumbah Road in the foreground below. It looks directly up at Mount Hobwee, on the NSW/QLD border. Much of the landscape in the pic is actually in Qld with the border swinging around to the left and towards the viewer along the ridgeline (includes Bushrangers Cave, the small pale spot above and to the left of the homestead). To the far left in the background is Limpinwood. Congratulations to Michael who has donated his prize to landcare. Christine Byrne from Uki sent in a remarkable photo of a recent 'planetary conjunction'. Venus, Jupiter and Mars were doing what might be termed a 'planetary dance', in that these planets came relatively close to each other, as seen in the sky. They're actually separated by millions of kilometres but the orbits of Mars, Jupiter and Venus have each come to a point where, from Earth, they align closely in the sky. ​The answer to last months quiz: Immature Golden Whistler (below left), along with an image of mature male bird (below centre). This month's mystery bird (below right) has very recently taken up residence in a nestbox in Fernvale. According to Land for Wildlife property owner Helen Manning, it roosts during the day, down out of sight, or if someone is walking in the garden below the nestbox, it occasionally pops up to 'have a sticky beak' at what's going on. Hint, it is not an owl or Tawny Frogmouth. The Green Cauldron Panorama in the Murwillumbah Visitors Centre continues to delight visitors. A recent visitor, the former editor of the National Geographic Traveller commented that he had not seen anything quite like it in the world, especially since some visitors actually have the opportunity to contribute to its evolution by painting in a tiny distant tree trunk. Two visitors who made a contribution last week were Margaret Greenway (pictured with Panorama team-leader Andy Reimanis) and Patti Cybinski, both from Brisbane. They were absolutely delighted by the experience.